Who hasn’t seen a cat grooming himself or herself? Indeed, cats groom themselves several times a day. They lick themselves to clean their coats, ears, eyes and toes, and to remove any loose hairs. Grooming is vital to a cat’s overall well-being. And they generally do a very good job at it. Nonetheless, cat owners can help their cats with their grooming, especially if their cats are young, older, or long-haired. 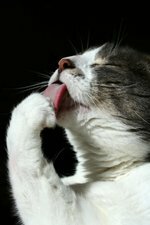 Check the cat grooming tips listed below to get started. Some cats don’t like being touched. Other cats would let you pet them only for a certain amount of time. Once you start grooming your cat, you'll know her "touch tolerance". If this is the first time you’ll assist your cat with her grooming, then start slow and keep your sessions short. You can later extend the sessions by increments. Eventually, your cat will get accustomed to the grooming sessions and will even enjoy them. One of my cats, for example, looks forward to her daily cat grooming. She gets all excited when she sees me with the brush. Brushing is an important element of pet grooming. Brushing your cat regularly will help in the prevention of hairballs. In addition, her coat will benefit from it. Brushing will keep kitty’s coat clean, healthy, free of tangles, and shiny. Plus, brushing provides a perfect bonding opportunity for both you and your cat. Brush your cat slowly and gently. Begin at the head and work your way towards the tail. TIP: Always brush your cat in the direction the hair grows. TIP: Make sure you select the right brush and comb for your cat. Take into account the type of her coat. A long-haired cat will need a different brush than the one a short-haired cat would need. There are different types of brushes and combs. For more information about combs, and brushes, visit our grooming supplies page. Another important element of cat grooming is nail trimming. Even though cats get rid of the old layers of their claws through scratching, they still need extra help - especially when their nails get too long. Clipping your cat’s nails can be tricky, even more so if you’ve never done it before. Most cats don’t like having their nails trimmed so you might need to have someone help you hold your cat while you trim her nails. To start, hold your cat, take one of her paws and gently apply pressure to the top and bottom of your cat’s pad. This will prompt your cat to spread her claws. Make sure you trim only the tip of the nail. Avoid getting too close to the vein (pink area). TIP: Buy a good-quality nail trimmer. Most cat nail trimmers I’ve seen are in the shape of scissors and many come with rubber-covered handles (great for a good grip). You can also find nail trim kits that include clippers, nail file, and carrying case. Very convenient! TIP: Keep your brushes and nail clippers in one place so when it’s cat grooming time you don’t have to waste time looking for them. TIP: Kitty is not used to your grooming her? Establish a schedule (at least at the beginning) so that your cat gets accustomed to it. You can also take advantage of your pet grooming sessions to do a "physical exam". Check your cat’s eyes, ears, mouth and teeth as well as the rest of her body. These regular check ups will help you detect any abnormalities. If you find something out of the ordinary, consult your vet immediately. TIP: While you’re examining your cat, give her a massage. It will help her relax and make your cat grooming session more pleasurable. If your cat is too dirty and brushing is not enough, you might want to bathe her. Of course, this will not be an easy task. Make sure you use shampoo and conditioner especially made for cats. Before bathing your cat you should have everything ready: brush, towel, shampoo and conditioner. It is also recommended to brush your cat before the bath to remove any loose hairs. Prepare the bath area (usually a bathtub or sink, but you can also use a large pan) before hand. Place a mat or towel at the bottom of the sink or tub to prevent your cat from slipping. 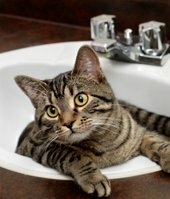 Place your cat on the tub or sink. Hold her gently but firmly. Pour moderately warm water over his or her body. Be careful to avoid the eyes, ears and nose. Apply shampoo first, starting at the base of the head, stroking all the way through the tail. Make sure you cover kitty's belly, between the toes, the base of the tail, and the "armpits". Use a wipe or wet cloth to clean kitty's face. Apply the conditioner after rinsing (optional). Again, avoid the nose, ears and eyes. Rinse thoroughly after shampooing to ensure your cat is free of any soap. Dry her thoroughly with a soft towel. TIP: Some cats get really nervous during a bath. You might need someone to help you hold your cat, especially if you never bathed your cat before. TIP: In addition to praising your cat after each grooming session, give her a treat. It will help her associate the grooming session with a pleasant experience. TIP: Do you think you will need professional help? You can find a qualified cat groomer to help you with your cats grooming. I would recommend to brush your cat regularly, at least 3-4 times a week. Of course, the frequency will also depend on your cat’s needs. Long-haired cats might need to be groomed more often than short-haired cats. Check your cat's claws periodically to determine if it's time to trim them. Help kitty with her grooming session by providing her with a self-grooming brush. There are several options to choose from. Some brushes can be mounted on the wall while others can be placed on the floor. You cat will certainly enjoy these brushes.